If you're considering adopting a new kitty with a loving disposition, check out the work of some amazing Ragdoll cat rescues before you get in touch with a breeder. These inspiring associations help keep Ragdolls and Ragdoll Wannabes out of kill shelters and help them find the right, loving home. The following organizations place Ragdoll cats. Two national organizations can refer potential Ragdoll parents to local organizations that may have available Ragdolls. Ragdoll Rescue USA is a non-profit organization that takes in Ragdolls and Ragdoll Wannabes from all over the US. They are located on the West coast, but will arrange transport from a home or shelter for the cat to a new foster or permanent home. You can fill out an application online if you are considering adoption, or visit their sister site, Ragdoll Rescue USA Adopters. This Yahoo group marks folders of cats available for adoption and exchanges information between the adopters. If you want to adopt a Ragdoll, or want more information about adopting this breed, this site can assist you. Search by folders or links at the bottom of the site, or sign up to be notified when new postings go up. Ragdoll Rescue NW is an Oregon-based rescue for Ragdolls and Ragdoll Wannabes. They are a small organization, working mostly out of Oregon and Washington State. They do transport the cats, as well as foster and adopt. The organization does not have a shelter; it relies solely on foster homes for their cats while they are waiting for adoption. Fill out an application online to initiate contact with a specific cat. Ragdoll International is an organization located in Rhode Island dedicated to the rescue and promotion of the Ragdoll breed. They have postings for Ragdolls available for adoption, but cannot guarantee whether those listed are true Ragdolls or Ragdoll Wannabes. If you want to surrender your cat, or adopt a cat, fill out an application online. Ragdoll Rescue is an organization that is dedicated to keeping Ragdolls out of shelters. 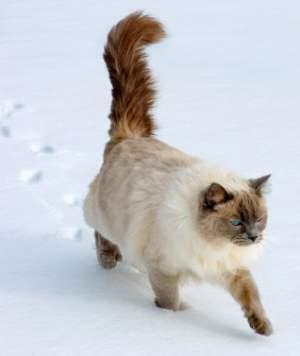 They operate in both the US and Canada and do their best to classify the cats as true Ragdolls or as Ragdoll Wannabes if the cats are unregistered. Ragdolls may be listed from all over the US or Canada; click on the links of adoptable pets in your country to see if an animal is located near you. Ragdoll Cat Rescue Associations have a common mission of saving lives and finding homes for Ragdoll cats that have been lost, abandoned or placed in "kill" shelters. In addition, they help Ragdoll cat owners who must give up their cats find appropriate homes for their Ragdolls. If you'd like to foster a Ragdoll cat or give one of these mellow cats a permanent home, consider contacting a Ragdoll rescue group.